μSTICK® and μSTICK® TOR are solid lubricant systems for wheel and rail. 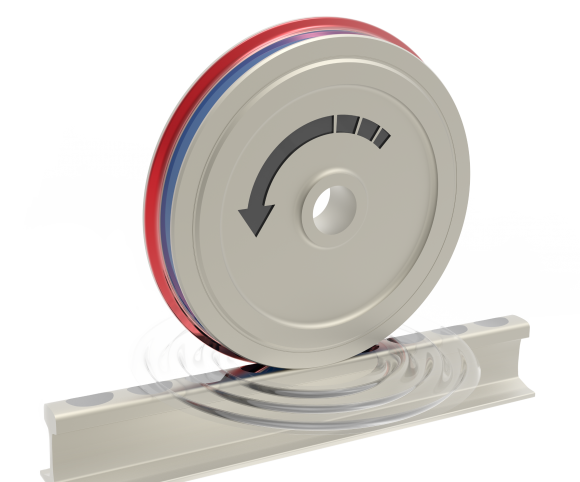 The solid stick, a solid lubricant embedded in a polymer matrix, is applied in small quantities directly to the wheel. μSTICK® ensures lowest coefficient of friction between the flange of the wheel and the gauge face and reduces wear dramatically. μSTICK® TOR ensures a traction coefficient, which increases with increasing wheel slip (“positive friction”) between the tread of the wheel and top of rail. This guarantees optimal traction without noise and corrugation wear. Both systems provide full fleet protection when mounted only to a certain number of axles per vehicle. The solid lubrication system requires neither a power supply nor a complicated control system. The solid lubrication system is completely selfregulating. μSTICK® is applied in very small quantities directly to the wheel by means of simple mechanical applicators. μSTICK® and μSTICK® TOR meet the latest fire safety standards. Even the most stringent requirements of the new EN45545 – Hazard Level 3 – are met. μSTICK® is a tunnel-grade wheel flange lubrication system!